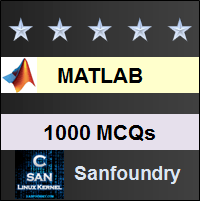 This set of MATLAB Multiple Choice Questions & Answers (MCQs) focuses on “Debugging”. 1. Can we save a MATLAB program while in debugging mode? Explanation: While in debugging mode, we are really trying out the function. So, when the debugging mode starts, the command line is halted at a certain line in the function and the evaluation of the function is stopped. Hence, it’s not possible to bring a change in the function and save it in the directory. We’ve to exit from the debugging mode and then we can save the function. Explanation: The keyboard command is pre-defined in MATLAB and allows us to enter the debugging mode. We need to give the command in our m.file where we want to start debugging and then the control will return to the keyboard where we will be able to give new value to the parameters involved in the function. Explanation: The dbquit command can be used to exit from the debugging mode. This is pre-defined in MATLAB. dbend and debugend commands don’t exist. 4. Which of the following command would allow us to continue the evaluation of a function in the debugging mode? Explanation: The dbcont command would allow us to continue the working of our function after we have entered the debugging mode. The continue command is used in loops, it won’t help us in this case. 5. What is dbstop command? Explanation: The dbstop command stops the debugging mode. Now, we can give the dbstop command in many ways. One of the ways is mentioning a condition, regarding when the working of the function should stop, to enter the debugging mode. To exit from the debugging mode, we need to use the dbquit command. Explanation: For anonymous functions, the dbstop command works differently in contrast to pre-defined functions. This nature of working is only for anonymous functions which are not stored in the MATLAB memory. The dbquit command is used to exit from the debugging mode. Explanation: This command will result in an error if it is placed within an m.file. This is because debugging commands can only be used when the control enters debug mode and we need to give these commands only from the command window. Explanation: The function will be saved and it will run. After enter the debugging mode, and making any desirable change, when we enter the dbcont command, the function will keep working until it invokes the dbcont command. Then it will result in an error and the control will break the evaluation of the function entirely. Explanation: In contrast to anonymous functions, the dbstop command will pause the working of a function just before the mentioned line. It will pause the evaluation and enter the debugging mode. Explanation: The debug commands can only be run from the command window. If they are present in user-defined functions or live scripts, the working of the function would entirely stop when any debug command is invoked while evaluation of the function. 11. What are the contents of a after the following events? Explanation: This is a simple code. The kernel will enter the debugging mode since the condition given by dbstop is not satisfied. The length of the x vector is 5 in the command window which results in the kernel to shift to the debugging mode. 12. What are the contents of a after the following events? Explanation: The first error encountered by the debug command is that the function name is missing i.e the function name must be given to the dbstop command. The second error is the fact that the function, defined already, has only 2 lines but we have asked the kernel to enter the debugging mode at line 5. Since MATLAB returns the first error it faces. 13. What are the contents of a after the following events? Explanation: We haven’t mentioned the line no. where the debugging mode should begin if the condition provided with the dbstop command is unsatisfied. Hence, debugging will start at the first line only. 14. What are the contents of a and b after the following events? Explanation: The dbstop command would work if the function is called after we have given the dbstop command. It won’t affect the working of the function if the function is called any more number of times i.e the condition provided in the dbstop command won’t result in entering the debugging mode if the working of the function does not satify it. 15. The return command is similar to the dbcont command. Explanation: The working of the return command is similar to the dbcont command. It will get from the debugging mode and return to evaluate the function completely.